Are you willing to save a life? At first I would like to ask you if you are interested to learn, “how to save a life”. Are you really interested to learn how to save a life by doing no more than 10 to 20 minutes workout if you found someone unconscious? If YES, then you are a GREAT PERSON, A HERO, and I have no words to praise you. AND if you don’t know how to save a unconscious patient’s life then learn it today and BE A HERO. 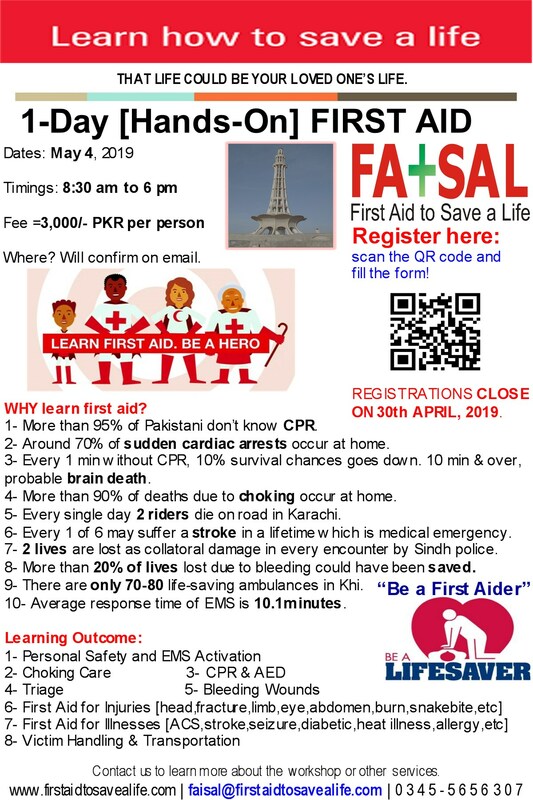 Let me tell you in steps about automated external defibrillators, sudden cardiac arrest and how First Aid to Save a Life Pakistan can help you to fight this. The killer of more than 400,000 people a year in USA and more than 140,000 people a year in Pakistan, sudden cardiac arrest (SCA) causes the heart’s normal rhythm to suddenly become chaotic. The heart can no longer pump the blood effectively and the victim collapses, stops breathing, becomes unresponsive, and has no detectable pulse. SCA can strike anyone, anytime & anywhere. Children, teenagers, athletes, old people — can all have SCAs. Although the risk of SCA increases with age and in people with heart problems, a large percentage of the victims are people with no known risk factors. How does and AED work? The bottom line is that with a modest investment, now you can have a heart-safe environment, where you live and work. Do you remember the sign of AED to find out/locate or ask for AED to help someone who is having sudden cardiac arrest? See this sign and look for it to get an AED when someone is found having SCA. If you didn’t find it anywhere then use your two hands to give CPR to save precious time and ask someone to call EMS (1122 or 115) or nearest hospital ambulance for evacuation. You still have done a lot of good work to keep his brain alive and you are still a hero for us and for those who understands your great work. Do you have an AED program in your organization? This entry was posted in AEDs, CPR and AED, emergency care and first aid, First Aid and CPR, First Aid CPR and AED, First Aid Training Programs and tagged aed training programs, aed training programs in pakistan, aed trainings in pakistan, aotomated external defibrillators in pakistan, are defibtech aeds available in pakistan, are difibtech aeds available in islamabad, are difibtech aeds available in karachi, are difibtech aeds available in lahore, are difibtech aeds available in peshawar, are difibtech aeds available in queta, are difibtech aeds available in rawalpindi, are you prepared to save a life from suddent cardiac arrest, cpr and aed trainings in pakistan, defibtech aed and its use to save a life, first aid to save a life, from where i can get automated external defibrillators in islamabad, from where i can get automated external defibrillators in karachi, from where i can get automated external defibrillators in lahore, from where i can get automated external defibrillators in pakistan, from where i can get automated external defibrillators in peshawar, how an aed can save a life, how dealth can be delayed or person can be saved with use of aed, how dealth can be delayed with use of cpr, how i can save a life of unconscious patient, how one can perform cpr or use aed to save a life, how one can prepare to save sudden cardiac arrest, how sudden cardiac arrest can take life, how to save a life, is it sure that use of aed will save life, registered aed training courses in islamabad, registered aed training courses in karachi, registered aed training courses in lahore, registered aed training courses in pakistan, registered aed training courses in peshawar, save a life, want to be a hero, what does this mean by worry free aed solution, what is aed, what is sudden cardiac arrest, what should be done to save a unconscious patents life. Bookmark the permalink.